Contact Improv workshop and jam with John Faichney and Suzanne Liska, June4-17. $1000Canadian includes tuition, dormitory, camping, all meals, taxes and transportation to and from the ferry on Lasqueti Island. Please arrive on Sunday, June 4th. You will be met with a limosine to bring you to the studio. Orientation is Sunday evening followed by a jam and sauna. Class begins Monday morning at 10am. This workshop ends after breakfast on Saturday, June17th with delivery to the 11am ferry departing Lasqueti. NOTE: It is possible to do just the first 5days of this workshop, Jun4-10. There will be 2 classes per day of 2 hours each with evening jams. Although suitable to new people and beginners, it is recommended that you be fit and willing to work through the discomfort of Spiral Rolls, Crescent Rolls and Aikido Rolls. This work and the partnering exercises we will use are accessible to all, you do not have to be an athlete or professional dancer. There will be higher level participants for those willing to explore lifts and flying. John Faichney studied dance at Oberlin College (USA), graduating in 1975. 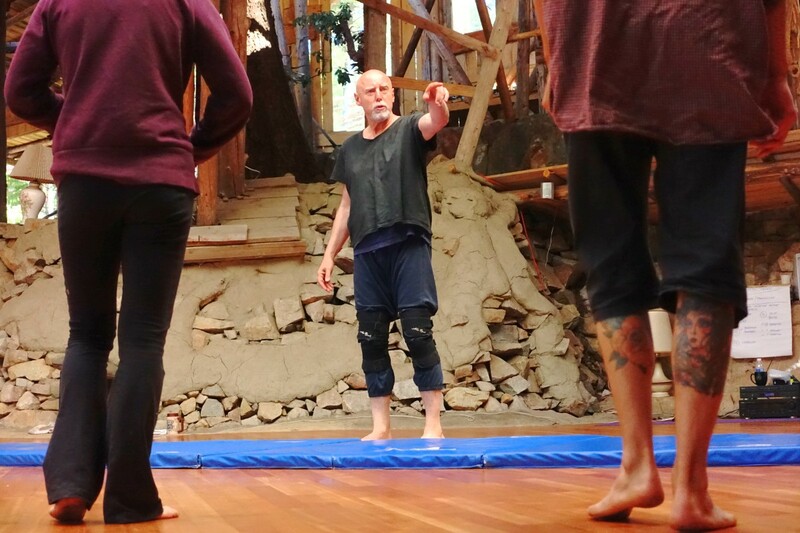 He performed in Steve Paxton’s proto-Contact-Improvisation work, Magnesium (1972), and, from 1973, pursued CI in parallel with choreography, group improvisation, and music theory. In 1976 he created a series of solo dances (including, for a European tour, Mutatis mutandis) which merged CI-inspired rolling technique and structuralist compositional principles.From 1979 to 1985, he was rehearsal director for Susan Macpherson, whose touring show, A personal collection, featured commissioned work by internationally-recognized choreographers. Since that time, John’s practice of CI has emphasized its resemblance to ordinary conversation, and, particularly, how specific mindfulness and techniques catalyse its full potential as ‘both-speaking-at-once / both-listening-at-once’ dialogue. 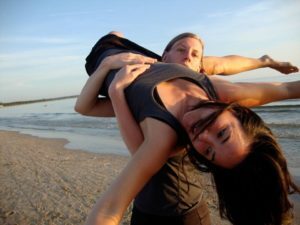 Emphasizing the interrelatedness of the mind, body, and identity, the classes will integrate the somatic practice of the Alexander Technique with Contact Improvisation. Combining these embodied approaches facilitates psychophysical changes while moving to uncover greater ease, options and new discoveries. In the classes we will research how to re-direct our movements and thoughts to access our underlying support and free patterns of tension. The CI skills taught will include a range of lighter rolling points to dynamic momentum-based lifts. We will awaken intimacy and surprise in ourselves to deepen our internal rhythms, spatial perception and connection with ourselves in relation to others. We will create movement as a group in the moment, exploring physical, spatial, emotional, rhythmical, and vocal scores. Solos, duets, and trios will be framed within the ensemble. Ensemble Improv Scores will be taught to develop awareness of the choices available to us on how, when, and in what way to respond with our whole self. How our choices affect others, ourselves and the environment will be explored. Movement exercises will be taught to engage our imaginations and will draw upon our body and mind as inspiration to access more presence and aliveness while dancing. Suzanne Liska is a dancer, choreographer, and teacher specializing in dance improvisation since 1998, capturing and expanding the boundaries of momentum and partnering. Co-founder of aLOFT, a CI performance ensemble, Suzanne collaborated with dancers in Canada, USA, Japan and Europe. As Co-Artistic Director of Flightworks co-produced the Danceworks Coworks Half Life Motel with Lucy Rupert of Blue Ceiling Dance. She has been a company dancer for Kathleen Rea since 2008, dancing in the three times Dora Award nominated Long Live. She has also worked with choreographers Rebecca Bryant, Susan Lee, Maxine Heppner, Pam Johnson, and Karen Kaeja. Suzanne holds Bachelor Degrees in Arts and in Education and has been a teacher for 16 years. She teaches professional dancers, actors, high school and elementary school students, and community dancers. Her main classes include Contact Improv, Conditioning, Advanced Partnering, AIM (Alexander Technique Informed Movement) with Susan Sinclair and Ensemble Improvisation. Funded by a SSHRC award while currently pursuing her MFA in Choreography at York University, allowed her the opportunity to research, teach and perform in Japan and choreograph a new piece for 2017. Suzanne has been a faculty teacher at the Randolph Academy for Performing Arts College program since 2011 and currently a course director in dance at York University. $1000Canadian, go to ‘Contact Us’ on the right side of this page to inquire or register. Send a message with ‘JUNE’ in the subject line. You will be responded to within 24 hours.